I had to ask a few questions to Amy Bailey (Kwindreth). We know Kwindreth died this episode by a backstab but why did she have to leave. 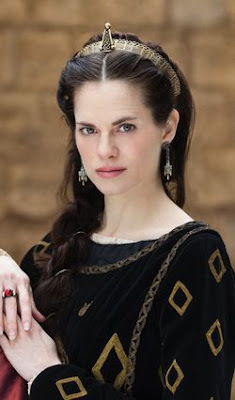 As it turns out because of her own pregnancy (7 months) she had to leave the cast of Vikings, and there was at that moment no purpose to Kwindreth anymore because she has lost everything (Michael Hirst his words). Athelstan did? In the dreams of King Eckbert or Judith? Amy: "That's up to Michael Hirst." What is your favorite scene you have played? Amy: "Mercian tower fight scene." If you could choose for another one's role in Vikings who would you choose and why? Amy: "King Eckbert or Floki. I like their unpredictability." Do you think Magnus will be a great player in defeating King Eckbert and Alfred? Amy: "I know but I can't say."